I guess that asking the loved one to marry you with a diamond ring is only second to asking her to marry you with the aid of a diamond phone. Benq-Siemens Mosaique concept phone isn’t made of diamond, but it might as well be, as it “toys” with expensive metals and allows you to customize its looks according to your mood. 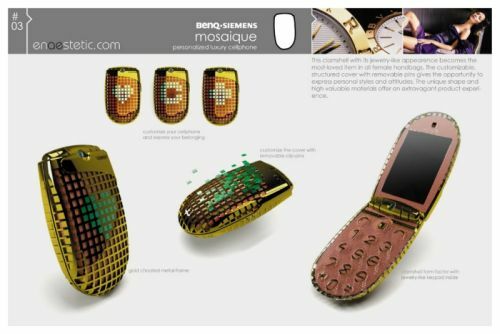 Mosaique Phone is pure jewelry, clearly targeting the female public who’ll be able to change logos and images on the phone’s cover, by using removable pins. They’ll probably be made of gold, platinum or silver personalizing the looks of luxurious ladies.